So I was looking through the pictures that my brother had sent from when he went to check out the house with his two sons... anyway, this looked like a good one to highlight first. 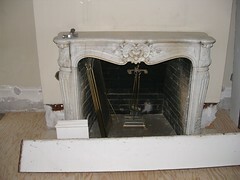 This is the living room fireplace. The story, near as we can tell... is that in the 40's the fancy schmancy lady that lived here brought it (and the central hall chandelier) to the house from Italy. It is rather lovely and has a crack in it. It is also, we have been told, inoperable because it is missing a flue or something like that, though this is a desert and there is not all that much of a call for a fireplace, but then we do actually turn on our heaters in winter here so who knows, we may have a burn day and light it up. Chris and I have debated about fixing in, or turning it into a gas fireplace... loads of discussion that is really rather irrelevant until we manage to unpack more. Hey can the marble withstand the heat generated by the fire... will it not crack ?